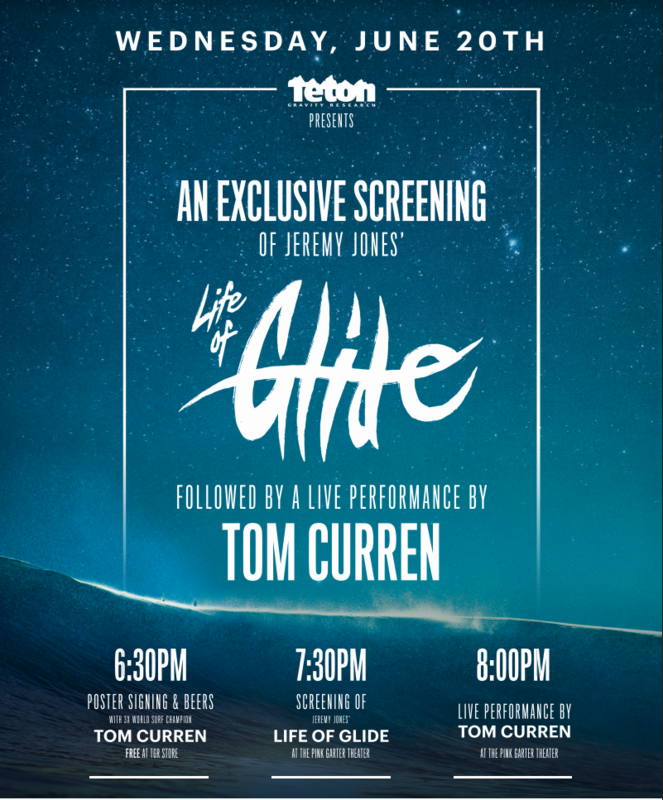 This Wednesday, June 20th, TGR will be hosting the Jackson Hole premiere of Jeremy Jones’ short film Life of Glide, followed by a live performance by legendary surfer and musician Tom Curren at the Pink Garter Theatre. The film explores Jeremy Jones’ relationship with surfing and snow, and how inspirations like Tom Curren shape his snowboarding style. Outside of surfing the biggest waves in the world, revolutionizing the use of a “fish” board, and winning three world championships, Curren has now turned his attention to music. His tunes span genres, taking cues from blues, folk, classic rock, and even reggae. Come join us for an evening of fun, including beers and poster signings at the TGR Town Store at 6:30 PM, the film showing at 7:30 PM, and live music kicking off at 8:00 PM at the Pink Garter Theatre.